Invitation: Concert "Brikcius in Řetězová IV." You are invited to cello recital "Brikcius in Řetězová IV. ", held on Saturday 29th October 2011, 7pm, at the Gallery Art Space Řetízek ("The House of the Three Wild Men", Řetězová 7, Praha 1, downstairs). 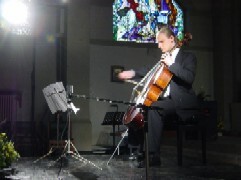 Czech cellist František Brikcius will be playing 7 Ricercari for cello solo by Domenico Gabrielli (1659 - 1690), III. Suite C-dur for cello solo, BWV 1009, by J. S. Bach (1685-1750) and Sonata for cello solo, Op. 25, Nr. 3, by Paul Hindemith (1895-1963). Next concert "Brikcius in Řetězová V." (Anna Brikciusová - cello) will be held on Saturday 19th November 2011. Tickets (200 CZK) and reservations (603 865 126, 603 879 564) at the door. In the cooperation with the Art Space Řetízek. More details on websites http://www.Brikcius.com and http://www.Retezova7.cz . "BRIKCIUS IN ŘETĚZOVÁ IV. " Saturday 29th October 2011, 7pm, Gallery Art Space Řetízek (Řetězová 7, Praha 1, downstairs, Czech Republic). Competition: Win 1 x 2 free concert tickets "Brikcius in Řetězová IV." What is the name of the composition by Domenico Gabrielli, played by Czech cellist František Brikcius at the concert "Brikcius in Řetězová IV." this October? Contest is over, lucky winner is A. K. from Prague. 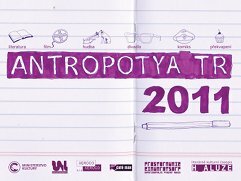 Festival Antropotyátr is partner of project "Saro-Wiwa". Italian Baroque composer and cellist Domenico Gabrielli was born on 15 April 1651 or 19 October 1659 in Bologna. He studied composition with Giovanni Legrenzi (1626 - 1690) in Venice and the cello with Petronio Franceschini (1651 – 1680) in Bologna. From 1680 until his death he was in the orchestra of the church of San Petronio. In 1676 he was elected to the Bologna Accademia Filarmonica and in 1683 he became its president. During the 1680s he was widely recognized as a cello virtuoso and composer of vocal music. Starting in 1683 he composed 12 operas premiered in Venice, Modena, Turin and Bologna. He was allowed frequent leave of absence from the church of San Petronio, but in 1687 he was for few months, temporarily dismissed for not attending his duties. He missed the moth important event of the year, the feast of St Petronius. He immediately went to Modena, where he entered the regular musician service at the court of Francesco II d'Este (1660 - 1694), Duke of Modena, for whom he often previously performed. His musician prestige allowed him to be reinstalled at the church of San Petronio in 1688. 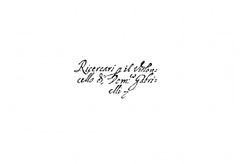 In 1689 he composed 7 Ricercari, one of the earliest attested works for cello solo. He was called "Il Minghino del violoncello", Bolognese dialect form meaning "Dominic of the cello". Domenico Gabrielli died on 10 July 1690 in Bologna. For more about Domenico Gabrielli visit http://www.Brikcius.com and http://En.Wikipedia.org/Wiki/Domenico_Gabrielli . Call for ... visit "Festival Antropotyátr"
Visit "Festival Antropotyátr 2011", held 12th, 19th and 20th October 2011 in Ústí nad Labem. Festival will feature Czech cellist František Brikcius, on Thursday 20th October, 8.30pm, at the Experimentální prostor Mumie (Velká Hradební 50, Ústí nad Labem, 400 01, Czech Republic), performing cello compositions by Johann Sebastian Bach, Paul Hindemith and Irena Kosíková ("Fantasie Saro Wiwa"). For more details see http://Antropotyatr.H-aluze.cz .